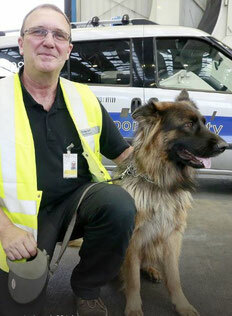 The Rhine-Main operator, Fraport has created a special squad of dog handlers, having the trained canines sniff out bedbugs in passenger luggage, cargo shipments as well as inside the cabins and holds of aircraft. What started as a single initiative by one Fraport employee has now turned into serious business, even beyond the fences of FRA. The demand is there… Right now! The population of Cimex lecturalius, commonly known as the bedbug, grows 45 percent each year, on average. Increasing steadily since 2009, when the UK-based Bed Bug Foundation conducted its initial survey. The parasite’s enormous growth rate was not identified in some remote and run-down location, which might provide the ideal environment for the bug, instead - Europe, where hygiene has played a significant role for quite some time. The world-wide victory march of the blood-sucking insect is driven by two main factors: an increasing resistance to pesticides and modern transportation, namely airlines, facilitating the propagation of the bug particularly by leisure travelers. “The world has become a global village,” states Fraport’s Larry Hansen, explaining the rapid advance of the scourge. His special squad, consisting of three handlers and their sniffing hounds has been on duty since last year. So, what are the first results? Have they already found bedbugs in any aircraft that have landed in Frankfurt? According to Larry “it has happened only once, so far” without revealing any further details. One can expect, that the expert findings are just the tip of the iceberg, which the statistics published by the Bed Bug Foundation also suggest. On a more general note, Larry indirectly confirmed this by saying: “Basically, the blood suckers could be anywhere, be it in containers loaded with imported second-hand clothing, personal items accompanying travelers, passenger luggage and pieces of furniture or cracks in transport boxes which provide ample hiding conditions.” Not only for the bugs – but even worse – for their eggs which hitchhike to someone’s home before hatching, if not detected. Airlines shy away from making the topic public, for understandable reasons! It contradicts their positive image of cleanness and comfort, harming their reputation. To prevent the risks of a bedbug infestation, carriers serving FRA allow their aircraft to be checked by exterminators or, more recently, the Bedbug Squad. It is the fastest, most efficient and cheapest way to make sure no bugs are hiding in the seats or small openings, attacking passengers during a flight while they are resting. After feeding on the traveler’s blood for several minutes, they tend to fast retreat back to their hiding place. “Our dogs are extremely well trained, able to smell any kind of bedbug no matter if it’s a Kenyan species or coming from Canada, London, Germany, Sweden or any other place,” Larry explains. 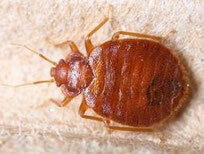 There are up to 80 known species of bedbug, according to the scientific literature. FraSec, a Fraport subsidiary, is the only specialist allowed to issue qualified certificates to dogs serving as bedbug sniffers at European airports. It seems to be a business with clear future potential, because not only are airplanes invaded by bedbugs but hotels as well - from cheap to luxury class, office buildings, warehouses, retail facilities or private homes. “We concentrate on our duties here at the airport but have simultaneously extended our services to hotels and other clients outside the fence,” Larry states. Rounding things up, it seems readily apparent that Fraport can propel their bug hunting initiative into a new business model and earn cash by fighting the spread of Cimex lecturalius at both the airport and other locations in the surrounding region. We hope that our readers won’t be tempted to scratch too much after reading what we think is an amusing but at the same time very serious issue.